3x5' Washington's Cruisers flag. This nylon flag is digitally dyed for excellent outdoor performance and durability. The flag comes with the standard canvas header and brass grommets and feature four rows of lock stitching on the fly end. Try a historical flag from All Star Flags. 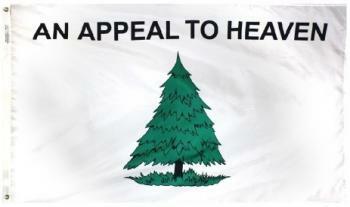 The historical Washington's Cruisers flag is made up of a white field with a green pine tree and the slogan "An Appeal to Heaven." The flag is thought to have been derived around 1775 when Col. Joseph Reed (Washington's Secretary) wrote of the need for a recognizable symbol that could be flown from the ships patrolling the Charles River so the vessels would know one another. The flag later became the Massachusetts Naval flag in 1776.